This guitar was Harmony's attempt to emulate the design of Rickenbacker guitars. They were available in sunburst and green sunburst. 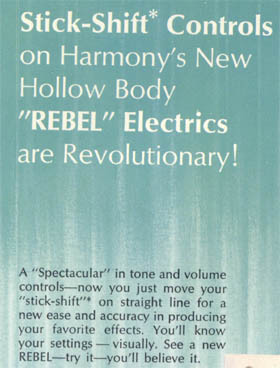 There was also a short-lived Silvertone version that had regular pots instead of the sliders. The sliders can get dirty with age and can be a bit noisy, especially on guitars that haven't been played in a while. Rebels were equipped with Rowe/DeArmond "moustache" pickups and a roller bridge which was unique to this model.